In the British port of Whitby, the Sarens crew was asked to for launch the new Guiding Light trawler. This 26m long, 8m wide and 12m high boat weighing more than 250t required the use of a Demag TC2800-1 lattice boom mobile crane. Indeed, the narrow limits of the site required the use of a powerful machine, stable and with a small footprint. The TC2800-1 was equipped with a 42 m main boom, a 30 m superlift back mast and a 200 t superlift counterweight. Once the official launch ceremony was completed, the TC2800-1 lifted the entire mass of the trawler with its 200T superlift counterweight. The load was then slowly and precisely slewed anti-clockwise until it was directly above the water. 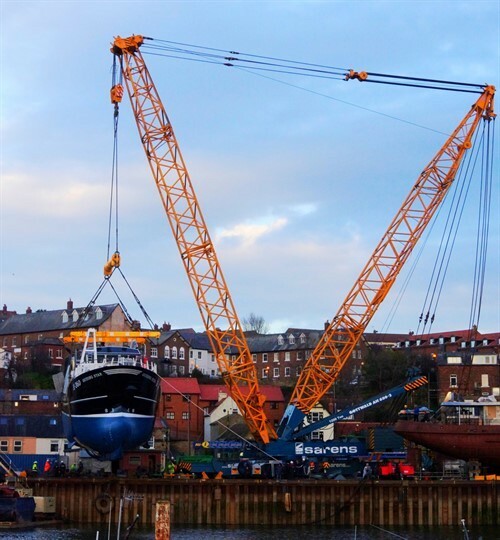 The trawler was slowly lowered into the water, releasing the weight from the crane and completing a safe and successful lift.